In thinking about “Blue Boat Home” (and various other starry things…) I’ve been reminded of the really great art the planetarium at home has. My family spent a vast amount of time at Staerkel Planetarium when I was growing up, to the point that apparently we spent many Friday nights there, and Dave the planetarium guy knew us on sight. We went to the star shows, science lectures (including the one my dad gave where they didn’t believe his name was actually Rockett, and the one where he held a blowtorch inches from some tiny kid’s hand as part of a demonstration), and even movies and at least one magic show, and I have plenty of memories of my brother falling asleep as soon as the lights dimmed, and playing with my playmobil on the “long” car ride home. I have no idea what my poor parents thought of taking us to the same shows again and again at our request… ^^; There was the “big” hill that we always took the opportunity to roll down, and the time we watched a total solar eclipse on the lawn with the rest of the community, and many many trips out on blazingly hot days to launch model rockets (and subsequently avoid them as they plummeted back in sometimes-near-misses) with the CIA. But one thing that I think has stayed with me much better than any lessons that involved images of giant pizza slices or geese projected onto a starfield was the beautiful scientific art displayed in the hall outside the planetarium. I love science as well as art, and I’m often disappointed that they’re seen as mutually exclusive – science can’t be visually attractive and emotionally appealing the way art is, and art has an awful lot of trouble representing science accurately. I get the sense that artists and scientists often speak on such different wavelengths that they have trouble grokking what’s going on with the other’s field (random: I’m amused that apparently “grok” is in this computer’s dictionary). The art at Staerkel does an impressive job, imo, of being both beautiful and inspiring in both artistic and scientific senses, which I find rare. 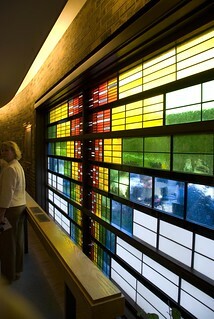 Before you even enter the building, there’s the beautiful modern rainbow stained glass window taking up the whole wall by the ticket counter. I had thought that there was a scientific significance to the patterns of bars in the rainbow, perhaps related to the absorption bands in the sun’s spectra, but in contacting the planetarium to make sure I found out that it’s just a pretty stained glass. :( Another case of almost-actually-scientific art. And while you’re waiting for your tickets, there’s the “Cosmic Blink” mural, which I feel does a great job of idolizing science and astronomers, in spite of its very haphazard artistic composition. Although there isn’t much of a focal point or sense of composition for the mural and figures overlap all over the place to provide a very chaotic impression, one thing the mural does capture for me is the struggle of humanity to understand the universe over the course of history, and the sense of amazement and wonder that came with that understanding. I think it gives one a sense as well as the discoveries and innovations that needed to be made, and that those are also worthy of wonder. I think the mural is to some extent a visual representation of why I love science fiction. A celebration of human spirit and curiosity; the struggle not only to understand our world, but also against ourselves as we try to grow; human innovation and technology; the sense or amazement and revelry in the beauty and possibility of this crazy universe. And among other framed photos, there was “Earthrise,” that beautiful image of our tiny blue boat home as seen from another world, a reminder to humility and wonder about our place in creation. I love art that can be attractive to the eye and also scientifically accurate – pieces that combine the emotional beauty of art with the intellectual beauty of science – and I think Staerkel Planetarium has a lovely collection in that regard. 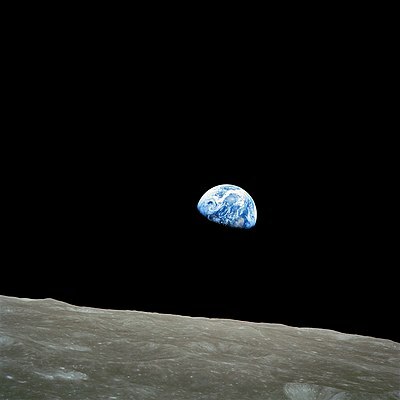 I do really love that “Earthrise” photo. I would put it on my wall at home. …Can I put it on my wall at home? Like a print of it? Do they exist?